Supermarkets: The new classrooms to teach Nutrition. Although we can appreciate the convenience offered by supermarkets, one has to ask: What has been compromised? The food industry of course, would like us to believe that nothing has been compromised. But it certainly has..
Our food system has changed a lot during the past decades. Most of these changes have been made without our approval or even our awareness. Yet, they can significantly affect our health, our environment and our values. In the past, a shopping trip would include going to the butcher, the baker and several other independent specialty shops. Shop owners knew their customers and would have been concerned about getting them the best quality food possible. The system now is much less personal. These days we go to one-stop supermarket chains that offer everything, from baked goods to TV dinners — even non-food items, from medicine to photographic services. As soon as you enter a supermarket, you are being manipulated. When you step into a supermarket to buy groceries, are you aware of what you’re really buying ? Do you read labels ? Perhaps you should start doing so. Today a great deal of research is invested in the manipulation of consumer habits, so that in the design of a supermarket and the placement of products, consumer preferences are not always the highest priority. For instance, the barely noticeable background music in a supermarket is likely programmed to make you spend more money. Music programmers choose popular tunes and analyse them according to beats per minute, style, chart position, emotional content, political content, and the age group to which a track will appeal. And this is just a small example from a big list. What about food and nutrition ? Well, the truth is that nowadays, most people in the city don’t know where their food came from, where it was grown, how it was produced and by whom, what has been added or taken away from it or where it travelled to get to their dinner table. In other words: people doesn´t know what they are really eating. The most effective way to fight against this manipulation is with a solid NUTRITIONAL EDUCATION. For a long time knowledge about nutrition was restricted to a bunch of professionals. But now, in the XXI century we are aware that nutrition and food knowledge has to be available for everyone in order to have a real impact over societies. Nutrition is something that should be taught in schools since very early ages as a subject. We need to learn what to eat when we are children in order to learn what food to buy when we are adults. And there are many ways to learn nutrition, as an example of this, an article published this month from the Department of Family and Preventive Medicine of the University of Arkansas shows how a supermarket tour can be an interactive experience in which students learn nutrient composition of common foods, requirements for various nutrients, issues related to eating behaviors, diseases associated with nutrient intake, and how food marketing, labelling, and regulation may influence what people choose to eat. This study also determined if the presentation mode of a supermarket tour influenced medical students' nutrition knowledge and attitudes. Last-year medical students received nutrition instruction in one of four presentation modes: live, small-group 2-hour virtual, large-group 2-hour virtual and large-group virtual in four half-hour sessions across 4 days. The same instructor gave all tours. Students completed pre- and post-course evaluations and knowledge tests. After the intervention, students participating in live and single-session groups had greater nutrition knowledge than the students participating in the extended course. Students in small groups also had higher confidence in giving nutrition advice. There was no difference among the four groups for enthusiasm. Students gave a higher recommendation to the live mode than to the extended version. So, what this study shows is that even a virtual supermarket tour is effective at improving nutrition knowledge, engaging, and providing information that students may use for themselves and for their patients. Learning nutrition doesn´t have to be a boring thing to do. At long term, nutritional education can be really beneficial not only to your health but also to your wallet. It is a very common belief that expensive products are nutritionally better than cheaper ones. Nothing farther from the truth. A very recent British study compared the costs and nutrient contents of five 'economy' line products of four major English supermarkets - Asda, KwikSave, Sainsbury and Tesco - with branded equivalents. Single samples of tinned tomatoes, long-life orange juice, potatoes, sausages and white bread were purchased in each supermarket. They represented items of potential importance in relation to 'healthy' choices in the shopping baskets of low income households. Nutrients analysed were fat, sodium, potassium, iron, calcium, vitamin C, and energy. And what did they find ? That economy line foods represent an excellent value for money and are not nutritionally inferior to the more expensive branded products. Not only common people can learn useful things about nutrition in supermarkets. Nutrition professionals can also learn a lot of interesting facts. As an example, there is a recent article showing the utility of using supermarket receipts to estimate energy and fat content of food purchased to identify families with a high risk to become obese. It might turn out to be a new preventive measure. So, next time you go to the supermarket don´t throw away your receipt: your doctor may need it. 1. 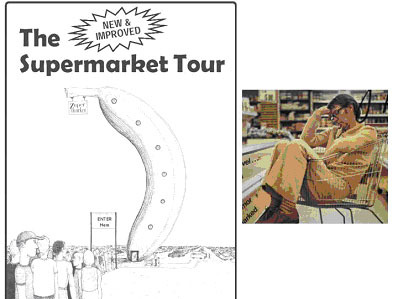 Supermarket Tour: The Effect of Presentation Mode on Nutrition Knowledge and Attitudes. Kahn RF, O'Sullivan P, Vannatta PM. Fam Med. 2003 Nov;35(10):721-725. 2. 'Economy' line foods from four supermarkets and brand name equivalents: a comparison of their nutrient contents and costs. Cooper S, Nelson M. J Hum Nutr Diet. 2003 Oct;16(5):339-47. 3. Use of supermarket receipts to estimate energy and fat content of food purchased by lean and overweight families. Ransley JK, Donnelly JK, Botham H, Khara TN, Greenwood DC, Cade JE. Appetite. 2003 Oct;41(2):141-8.